Flaws: Short, but not necessarily a flaw. Exceptional qualities: Robust growth. Great size, Superb form. Profusion. 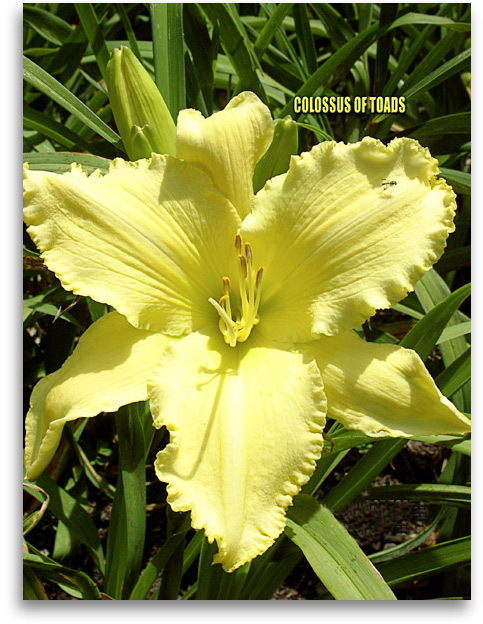 Huge, lively, light yellow flowers with bold form are produced in great abundance. Visitors always comment on and often want Colossus of toads. I don't know whether I'd call it a flaw, but this one is darned short. I like the height. There is something humorous about giant flowers on scapes so short they reach half way to the ground. Virginia breeder Jerry Dickerson discovered this in an intentionally unwatered, weed-infested bed where some final contestants were being evaluated for resistance to hard times, like the ones we're having now. This is one of the ones that came through. Even in the poorly grown bed, the flowers were held well above the low, arching foliage. 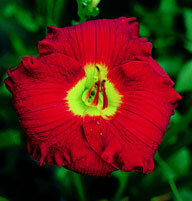 I recommend this as a very easy parent and good breeder for narrow flowers with great size. It is producing fine seedlings for me and for other breeders who have guested it. It passes on its beaded, sawtooth edges, its size, and best of all, its vigor and vitality.